Whether you’re looking for the perfect knee-deep powder day or the best Spring Jam a ski trip can be the perfect vacation. With skiing on all seven continents (sometimes), you can plan a killer ski trip that meets the needs of you and your crew with just a little research. The first step: define the type of vacation you are looking for and when you plan on going. If it is a spring blowout you are looking for, going somewhere in the northern hemisphere in March or April is an option. However, if you’re vacation time comes in August or September check out ski resorts in the southern hemisphere. Resort websites often advertise fun events, amateur competitions and parties. If it’s the perfect powder day you dream of, consult a weather source, stick to the hemisphere that will be in winter when you’re planning on going and contact the resort to find out when they usually get the most snow. Check the ski report on their website if you are planning a more spontaneous trip. Step two: Determine what type of skiers are traveling with you. All resorts boast a good mix of terrain, but know there is no regulated classification system for rating run difficulty. An advanced run at Killington, Vermont is not the same as one St. Anton, Austria; the Appalachians are much smaller than the Alps. If your group tends toward novice, look for resorts that boast a family experience, a good ski school with high-level instructors and/ or great après ski. If nothing else, adult beginners can take breaks and sit by the fire drinking toddies. 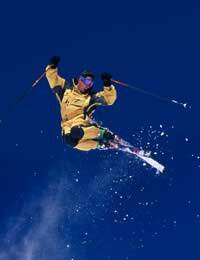 Connected resorts like Snowbird and Alta in Utah, USA, Les Trois Vallees in France (along with many other European resorts) or Valle Nevado-El Colorado-La Parva in Chile offer greater terrain variety for all types of skiers. Whether connected by lifts or just a pass, as in the case of Colorado’s Summit County ski areas, skiers get their moneys worth. Another thing to keep in mind is time spent not skiing. Après ski, lodging, and off-snow activities are vital to a good trip. Ski-in Ski-out is a relative expression, so verify your lodgings are as close to the lifts as you want to be. Determine if the accommodation is really walking distance, or near connection lifts or serviced by public transportation. Remember to choose your accommodations with transportation in mind, relative to your plans. America is a car-based culture so planning to stay in town or on the ski area can mean needing a ride or renting a car. Is your hotel near town bars, or does it have its own watering hole? Are you near a music venue? Where do the locals hang out? Remember, if you imbibe, don’t drive, so confirm public transportation before you go. Before you go, note if you need to bring your equipment or if the resort rents modern equipment. Smaller ski areas often can’t afford to update their rental gear very often, so it is safer to bring your own boots. Ask if they offer the latest demo gear. Also, check out what voltage outlets use, so you can bring adapters for your boot warmers. If traveling with kids or beginners, look into kids programs and the ski school, many times resorts offer deals for non-peak days and alternative fun for all age children. Taking a day to rest your legs can increase the quality of your ski days. Many resort towns offer numerous activities for non-ski days. Sledding, ice-skating, snowmobiling, snowshoeing, sleigh rides, dogsledding, shopping and spas are just a few to look into. Check with the local chamber of commerce or office of tourism to learn of all the area activities. Many ski areas also offer snow-cat, helicopter and guided backcountry skiing if you are looking for more adventure. Skiing is a great way to get fresh air, exercise and visit places you’ve never been. Whether you’re just looking to unwind or have the adventure of a lifetime, planning a ski trip can take you anywhere in the world and leave you with stories you’ll tell forever.